Scientists have been giving octopuses the love drug MDMA and observing the results to better understand how the drug works and how it can be used in human therapy treatments. MDMA, the active psychoactive ingredient in the drug Ecstasy, sometimes known as Molly, is known to induce positive social bonding in humans but neuroscientist Gül Dölen, who studies social behavior at the Johns Hopkins University School of Medicine, wanted to know more about how it works so he conducted a novel experiment with octopi. 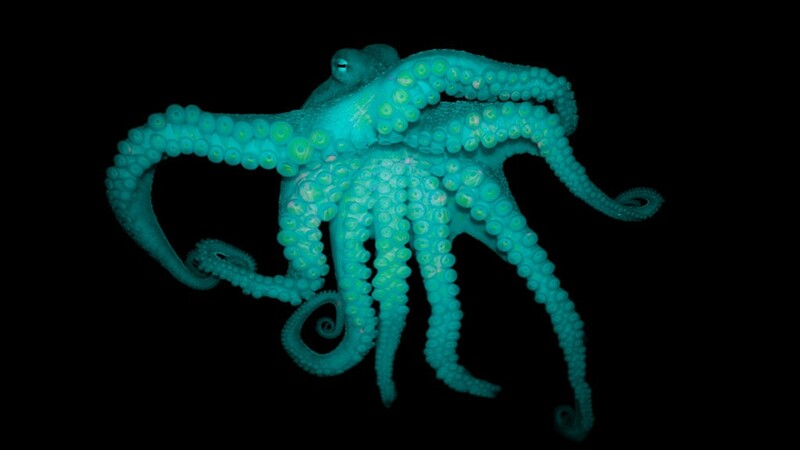 With the help of octopus expert Eric Edsinger, from the Marine Biological Laboratory in Woods Hole, Mass., Dolen allowed 4 octopuses to swim in a bath of dissolved MDMA for 20 minutes and then observed their subsequent behaviour. After their Ecstasy bath they were placed in a tank with a chamber either side of it.In the left chambers was a Chewbacca Star wars toy that they could paly with and to the right was a flower pot under which was another octopus. The pot had hoels in it so the octopuses could see and smell each other. Octopuses are notoriously shy creatures that do not interact socially unless they are mating. Without their MDMA bath the octopus would choose the chamber with the Star Wars toy but when dosed up on MDMA they chose to communicate and interact with the octopus hiding under the flower pot. The octopus on Ecstasy appeared “floaty and relaxed, hugging the flowerpot” says Dölen.This is further evidence that MDMA enhances sociability although this octopus behaviour won’t surprise anyone who has seen clubbers high on MDMA hugging each other. “As far as the behavioral traits, the octopuses being more prosocial, it does support what we are seeing therapeutically,” says Allison A. Feduccia, form the Califoria based Multidisciplinary Association for Psychedelic Studies, and is also the author of a pilot trial of MDMA-assisted psychotherapy for social anxiety in adults with autism. 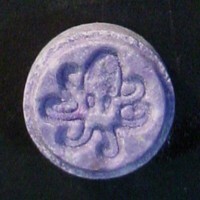 An Ecstasy tablet with an octopus logo, consumed by human clubbers. This was not given to the octopus in the experiment. They were given a bath with MDMA dissolved in it. I thought drug testing had been banned on animals?